Line up the dominoes in four rows of six or as pins at a bowling alley would be displayed (4 pins in the back row, 3 in the next row, 2, and then finally 1 in the front row). From a distance of about three feet, roll the marbles toward the dominoes. If desired, you can mark a starting line with a piece of tape. Each player is allowed four tries, and receives one point for every domino that is knocked over. Play up to three sets—the first person to win two sets wins. The trick to this game is to find a player who knows nothing about TEGWAR. The goal of the players in the know is to make the unsuspecting player believe that he/she is doing well, all the while making up the game as you go along. Let the other player win a few hands and show him/ her some basic moves (for example, pick up a card, place it in front of you). 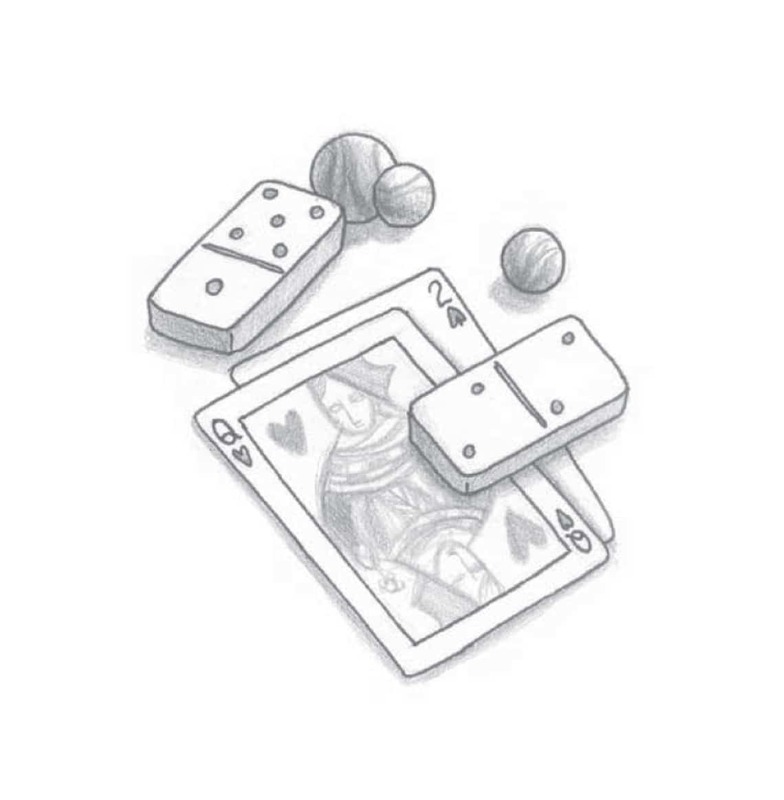 Blue-plate special: Put down two cards (such as a 3 and 4 of clubs) and act like this is a really good accomplishment! Principal’s office: Take a card from your hand and tell the other players that the card is being sent to the principal’s office. Then place the card at the bottom of the deck. French fry with mustard: Take any card from another player’s hand. Jack of diamonds takes all clubs: Ask everyone to give you all their clubs. Ping-Pong: Give everyone back all of their clubs. You can set a goal like: first one to get all of the queens, wins—or not. It’s up to you. That is why it is called The Exciting Game Without Any Rules. Keep on playing the game until the unsuspecting person seems really, really confused. Then, fess up (let the person in on your little secret). Have a good laugh and go find a new suspect.